Can I counter Yahenni's Expertise with its free spell? What happens when Yahenni's Expertise is cast with Scrap Trawlerin play? If I cast Yahenni's Expertise on my opponent's turn using Brain in a jar ticking up to 4 counters, can I cast a 3cmc or less spell for free that is NOT an instant? All creatures get -3/-3 until the end of turn. SynergyBuild Seedborn has been great honestly. I've had it stick for several turn cycles on multiple occasions. It avoids a lot of Pernicious Deed s and Toxic Deluge s fairly well (I ran Yahenni's Expertise at one point, which Seedborn is also out of range of). Now, Notion Thief is something that I don't expect to last long. I usually expect it to bait answers, but I'll cast it on a greedy player's explosive turn to punish them and develop card advantage in the process. If they're smart, they need to find an answer to remove it. However, this guy can really disrupt someone's plans for a turn which works well with my gameplan because I can stall them out. 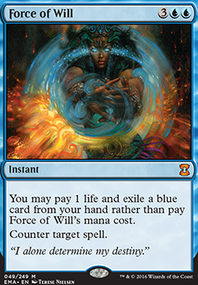 Chain of Vapor was removed in favor of permanent removal such as destroy and exile effects. I've found myself not needing it, even to protect something on my board. Nickel-Bolas on An Audience, Granted. flibety Thank you for your suggestions! Let me address them in order: First, the reason Thopter Assembly is in the deck is to fulfill one of the win conditions, the combo with Time Sieve for infinite turns. 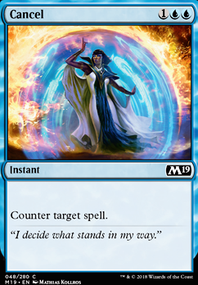 Duplicant is here to act as repeatable removal for problem creatures as a tradeoff for not running as much single-target instant and sorcery based removal, and the same for Noxious Gearhulk . Baleful Strix is there fore early game card advantage, and Wurmcoil Engine is present to act as a threat, because, well, it's Wurmcoil Engine, and Sphinx of the Steel Wind is a threat that bypasses red removal and green reach blockers. Second, Mycosynth Lattice is in this deck for a couple reasons. The first is that in a combination with Darksteel Forge and Nevinyrral's Disk , it leaves all my permanents intact while also dealing with those of my opponents. Scourglass is for redundancy in case I don't draw any of the aforementioned cards, as it is a solid boardwipe on its own. And Null Rod is in here to combo with the Lattice to cut every player off of mana for the rest of the game and begin a war of attrition, which I will hopefully be able to circumvent using Omniscience . Thirdly, Nevermore is in the deck as a pre-emptive silver bullet against hosers like Manglehorn or Stony Silence . 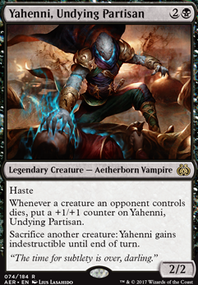 And lastly, Yahenni's Expertise is here to provide an out against token decks, at times in which my own creatures matter less than survival. I have one more cut to make to find room for Second Sunrise , which is the prime hit for casting off the expertise. This is not an all-out combo deck, I'm trying to lean in more on the value side of things, which is why the majority of these cards exist to act in separation from each other, rather than as a fine-tuned machine. flibety on An Audience, Granted. You may want to consider cutting one or more of the following creatures: Baleful Strix , Noxious Gearhulk , Duplicant , Sphinx of the Steel Wind , Wurmcoil Engine , or Thopter Assembly . Definitely do not remove them all, but you have quite a few creatures that directly work with artifacts. 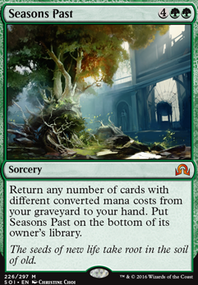 This means that having quite a few artifact creatures that arent necessarily serving a purpose towards your win condition may be somewhere to start with removing cards. Mycosynth Lattice should be removed, as it has anti-synergy with Nevinyrral's Disk (it would also destroy all of your lands and planeswalkers), Scourglass (it wouldnt destroy anything), and Retract (it would return all of your lands to your hand). It could also combine with Blinkmoth Urn to massively increase your opponent's available mana. While it does have powerful synergies with some of your planeswalkers, these drawbacks would essentially make it a dead card in hand at best and a powerful asset to your opponent at worst. Are these worth the upsides? 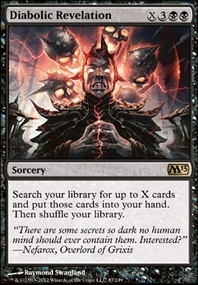 Do you have cards in mind that you would target with Nevermore and do you anticipate facing decks with these cards enough to warrant having this card in your deck? Most of your creatures wouldnt survive the -3/-3 from Yahenni's Expertise , so which card would you be hoping to play with its effect that would be worth killing off a serious portion of your creatures? Wouldnt Null Rod affect you negatively much more than your opponent, as you have many artifacts with cost activated abilities? Don't think Yahenni's Expertise belongs in the mainboard of a token deck. Even though there are situations where it's just the card you want, it's generally just counterproductive. 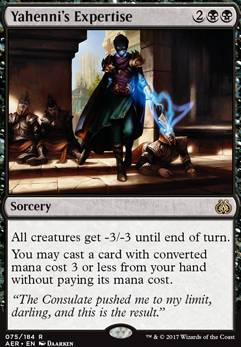 maybe you could try some of the expertise cards from Kaladesh like Yahenni's Expertise, it could give you another way to cast your suspend cards if you don't draw into as foretold.